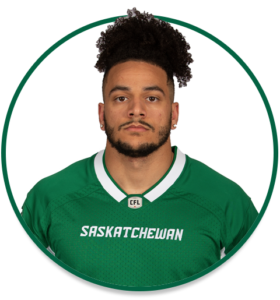 PRO: Signed with the Riders in June, 2017…selected by Saskatchewan in the 5th round of the 2017 CFL Supplemental Draft. 2018: Played two regular-season games…picked up one special-teams tackle. COLLEGE: Spent three seasons at Tusculum (2014-16)…played 31 career collegiate games for the Pioneers…collected 224 defensive tackles, nine tackles for loss, six forced fumbles and four quarterback sacks…named 2015 All-South Atlantic Conference First Team…spent the 2013 season at North Dakota State College of Science…played 10 games, registering 80 defensive tackles and one interception.